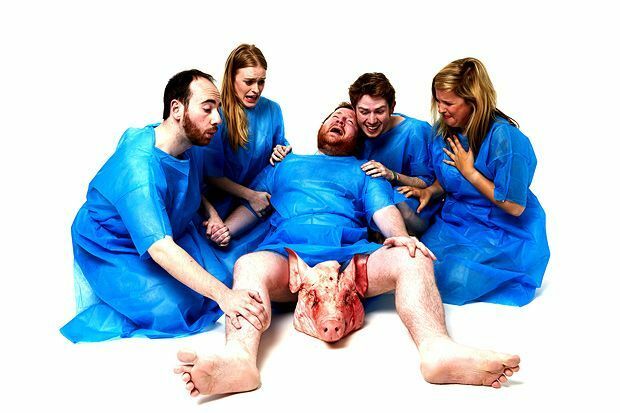 The Jest get a big fat thumbs-up for one of their publicity shots this year, a hospital scene in which a man appears to be in the throes of giving birth to a pig’s head. Expectations were reasonably high upon entering the Dome venue. But, like coming downstairs on Christmas morning to an empty living room, excitement quickly turned to baffled sadness. An audience-participation dance routine has one germ of a neat idea (it’s the only thing remotely close to a twist here and so it would be pointless to reveal it), but fizzles out into a large bunch of not-much. The idea of a man sat fixed in a chair requiring an audience member to follow an instruction and activate them might be a little too Luke McQueen for anyone’s liking and are impersonations of Harry Potter characters really the cutting edge of sketch? Worst of all, there seems a little bit too much of a reliance on ‘I’m gay’ and ‘I’m not gay’ as punchlines and the recurring gag of a not-great magician hopping on stage really should have not got past first-draft base. A couple of other reviews have suggested going into The Jest’s show with a drink (or three) inside you. One of them specifically recommended cider. If this is the only way to appreciate a sketch show, we may as well all just retire to the pub. Pleasance Dome, 556 6550, until 30 Aug, 10.45pm, £7.50–£10 (£6.50–£9).